I call my GPS Sacagawea. She’s been a tremendous help on this road trip across the United States. 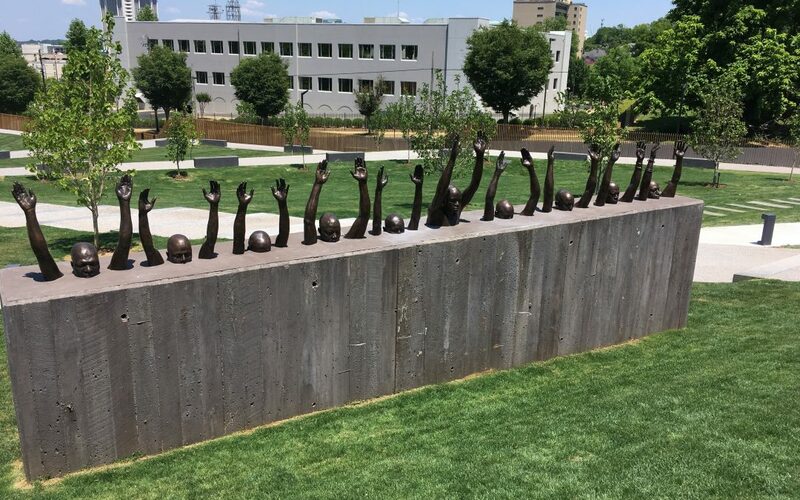 Don’t get me wrong, I love my maps, but when it comes to negotiating our way through, say, Montgomery Alabama’s inner city to the Memorial for Peace and Justice (aka the National Lynching Memorial) she rules. Unbiased in terms of the scenery, her focus is to get us there in the most direct manner. Which is how we found ourselves weaving through a dilapidated neighborhood full of boarded-up houses. Like everything in the south that sits unattended for too long, moss and vines were slowly reclaiming the once ornate homes, pushing up through the cracks in the sidewalks, winding up the trees and around the abandoned cars. But the neighborhood was by no means dead. Children played happily in the streets. Adults hung out on the rotting porches of the houses that weren’t boarded up. The heat was stifling, the humidity registering 90%! For me, driving through that African American neighborhood made the memorial experience that much more meaningful. 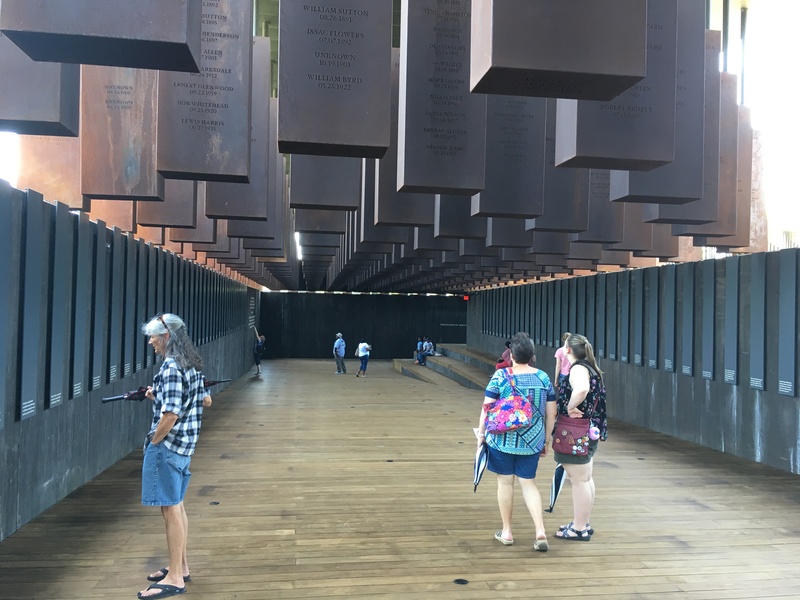 Strolling through the hundreds of large coffin-shaped boxes bearing the names, dates, and places of those who’d been lynched was shocking, sorrowful, anger-inducing. There were so many! It made me see the whole era in a new light. What happened was a holocaust. Whole families were murdered in a single shot, as were people who were trying to create change. The ones that made me the saddest were the ones marked as anonymous, as though their names weren’t even worth learning. 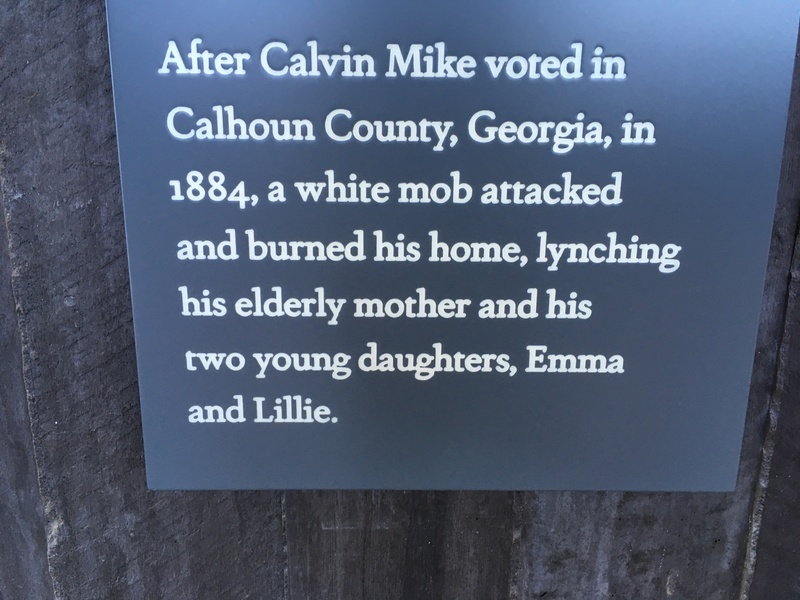 I was surprised to find out that Georgia topped the list in terms of lynching. Then again, who knows how many backwoods lynchings occurred? 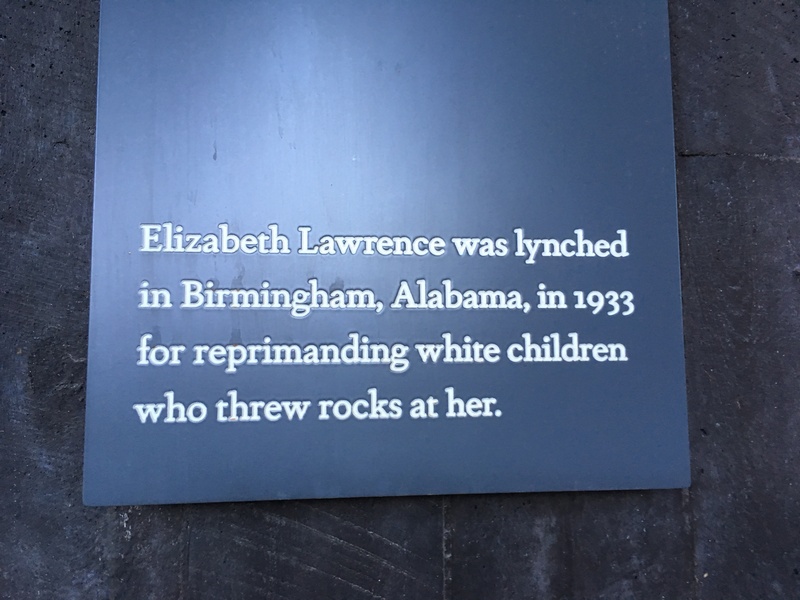 And by that I mean, lynchings that were not recorded. 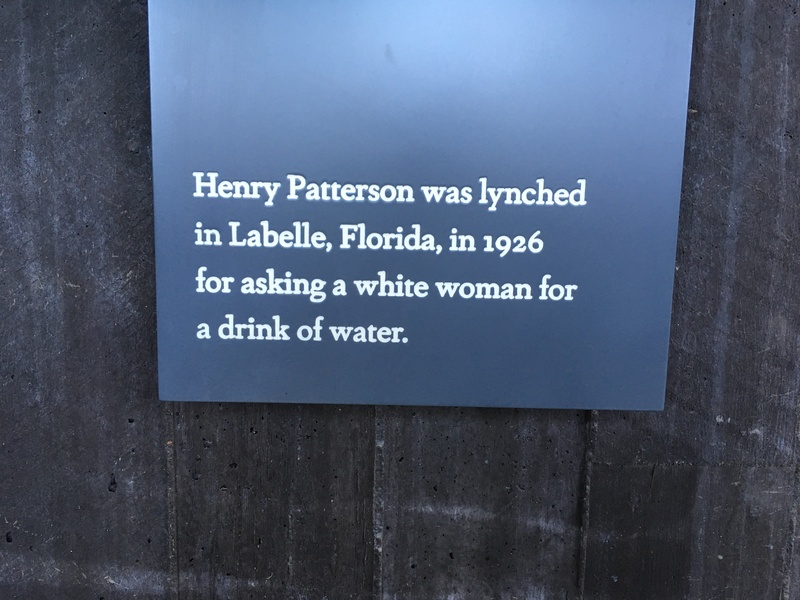 I was also surprised to learn that lynching was happening into the late forties. And not just in the south, either. Later, at a truck-stop Subway just outside of Montgomery, I’m standing next to a truck driver from Mississippi. He’s young, a gentle spirit with kind eyes. He asks, “Do you know what city we’re in?” His accent is so thick I have to ask him to repeat himself. I tell him we’re not far from Montgomery. I ask where he’s headed. “Texas,” he says. I ask what he’s hauling. “Don’t know,” he says. “They just load me up and tell me where to go.” He asks where I’m headed. I tell him about Dixie’s and my trip. Tell him we want to see this country we live in. Tell him that during this era of polarization, we want to see the actual people who make up the United States. “How’s it going?” he asks. I tell him so far, everyone I’ve met is really nice. He laughs. “One on one, everyone is nice,” he says. “It’s when people get into a group that you have to worry.” I guess I should mention, he’s black. Cut to Wilkesboro, North Carolina, standing in the park office of a campground. We’re checking in for the night. We’re in between intense bouts of rain and eager to set up our site before the next onslaught. I note a sign indicating they hold worship services on Sundays. The amount of Baptist churches we’ve passed leads me to believe they mean Christian. The elderly couple signing us in are volunteers at the campground, married and pleasant enough, though the woman has glanced twice at the brightly colored Virgen de Guadalupe I wear around my neck. (Purchased a few years back from a gay man at the Saints and Sinners Literary Festival in New Orleans. “I figure we sinners need saints!” he said.) The medallion seems to disturb her. Or maybe it’s that Dixie and I are traveling alone together in a van. Or maybe she just has indigestion. Who knows? I do what I always do when people are grumpy or mean: attempt to make her day a little sweeter by simply being kind. And I was getting somewhere. The woman was lightening up, had started to laugh. Then another camper strides into the office behind us. She too is trying to beat the rain, and clearly a lesbian. Has a flattop and all. She says she’s traveling with her “roommate”, a euphemism I guess people still use here in the Bible Belt. Apparently it’s not safe to be openly gay. Much as I wanted to respond by saying, “Really? I’m traveling with my wife” I didn’t. If she didn’t feel safe, a woman I presumed from the plates on her giant RV was a local, I sure wasn’t going to presume. And just like that we were polarized. The happy heterosexual camp hosts on the one side of the counter, and the happy but closeted lesbians on the other side of the counter. There have been signs of this polarizing all over the place: in Texas, along the Rio Grande, a dumpster painted with the words Resist the Wall! ; a Georgia governor wannabe proposing deportation busses. Prejudice is everywhere. Including inside me every time I see one of these Thank Jesus! signs stuck in people’s lawns, which seem to me not so much a suggestion as a demand, as if anyone who doesn’t take the Bible literally, or is, God forbid, not a Christian, is Other. And I find myself getting all defensive and thinking to myself, Hell yeah I’m other! And proud of it! without ever even getting to know the people who put the sign there. Or why they put the sign there. 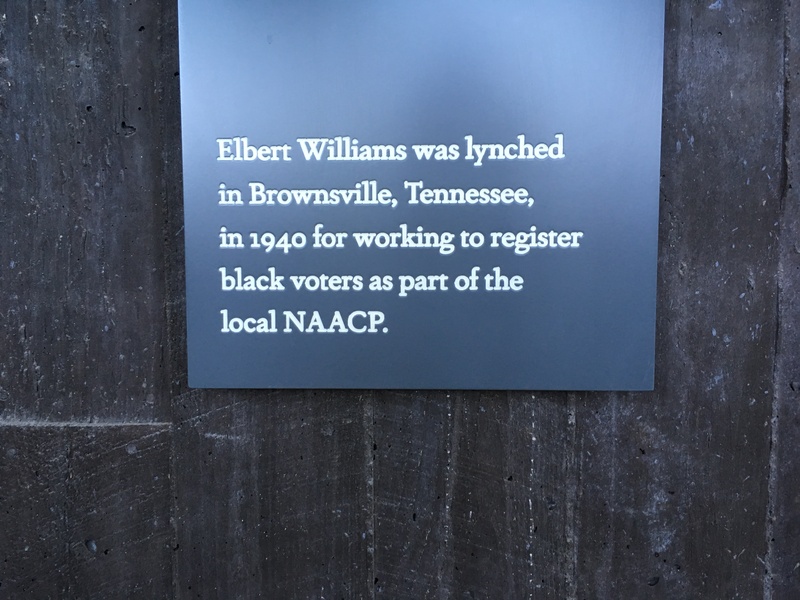 It brings me back to something I read at the Lynching Memorial, how thousands of people came out to witness the lynchings. I think about the bus driver’s words. “One on one, everyone is nice. It’s when people get into a group that you have to worry.” Apparently it’s easy to do the unconscionable when shrouded by a group, or urged on by a group. And at the same time, coming together with likeminded people, like the Women’s March on Washington, is one of the most effective ways to create change. Anyway, I’m not done thinking about this. I don’t suppose I ever will be. I’d be curious to hear your thoughts. And remember, now more than ever, live the love. It’s all we’ve got. Hi! I’ve signed up for your newsletter, thank you! 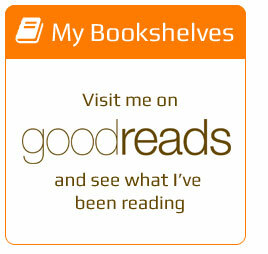 I wanted to go back and read all your travel posts, but there’s not a link for previous post, or next post, or archive. A few of the posts are tagged with Travel Log but most are Uncategorized. I know it’s a bit of work, but when you get home could you maybe add a link at the bottom of each post for Previous Post? Or an Archive listing/calendar? Then, I promise I will read every single travel post! Thank you and cheers for a great roadtrip. Allison. Thanks for the feedback. Will see if I can figure that out. Wow! That is some kind of experience that you are having! And to be in the heart of the history of such hate and ignorance and human violence against humans. I am so glad that you and Dixie are being able to take this adventure of a lifetime together! When I read this I almost felt as if I were traveling with you. That is not only because of your writing ability to bring the reader right there, but also because I love you and Dixie! Wonderful post Cliff. Really makes you think. Safe travels. p.s. Checked in with Meg (I think that’s her name), all good next door. It is Meg, and thank you. Love the hood. There’s a missing “t” after “I” after the Calvin Mike photo. Ha ha ha. I love your writing, Clifford and miss you two at the Fun Institute. Thank you for bringing along anyone who wants to experience your journey with you. This one does come with so many thought-provoking questions. The t has been added. Thank you! So great that you two stopped over here in almost-Philly. Great visit. Keep on bloggin’. Wow, this is just mind boggling. You write it so well Cliffi & thank you for sharing. I am so angry just reading about it. BTW, we ate at the PPig the other night again & talked about our latest visit there with you and Dixie. Thank you. Keep on loving! Montgomery Ala is not a place I’ve ever wanted to go for obvious reasons, but now I might have to in order to see that museum. I assume the cement wall sprouting black heads and arms is part of the museum–it’s so powerful I almost threw up. I’m really curious what the interracial feelings are in the South today, at least the observable ones, particularly in Ala and Ga. When I was last in Ga, we didn’t have Black Lives Matter. I wonder if it’s made a difference down there. Take care, you two. I can almost feel the damn humidity, but not like you can! Thanks for posting and pix. Sorry if I caused you to have unpleasant flashbacks to your time here. Miss you. Hope you are writing. You had me at Sacagawea. I just call mine Ms. Google. Sigh. But seriously, there’s so much to think about here and I am still thinking. I’ll be embarking on my own journey, not of distance but a big change (well, a bit of distance). I’ve spent the last year at my job learning about white privilege and it’s been stunning (in a stunned way, not a beautiful way). So I appreciate your journey and look forward to following your updates (and reading your new book). I love that! Cyber bow to you. And we are made of the same cloth for sure. Namaste, dear loved one. Hope your journey is full of joy. This is very beautifully (and, I think, accurately) felt and expressed. Thank you. The truth for sure. Prejudice is hard to surpass. But consciousness is the first step methinks. Your words and photos are so powerful. Thank you for taking on the journey of trying to understand this divided, proud, and shameful country of ours. We all benefit from of it. Miss you tons! See you kinda soon. Hi Cliff and Dixie, I just came across this post and really appreciate your including us all in your adventure. I am very moved by your visit to the lynching memorial having just read Sue Monk Kidds, The invention of Wings. It is daunting to realize anyone can treat another human being that way and yet it persists. A part in the book stands out about the punishment both the young white girl and the slave she taught to read sufferred. Made me realize how important education really is and what a game changer it can be. Have you been to Charleston? Sending love to you both from here on Maui. Love your writing! I loved that book. The audio book of it is wonderful too. Both read and listened to it. Have not been to Charleston. I am so moved by the driver’s eloquent and profound observation. We lose ourselves in groups, sometimes for the better and sometimes for the worse — but groups most certainly are not simply a gathering of individual people. Our tendency to see others as equivalent to their group (the defining and obliterating homogeneity of the label) is hugely problematic; where is the humanity? Thank you for sharing this.